Marrakesh is a bustling city and the focus of the fight against climate change. 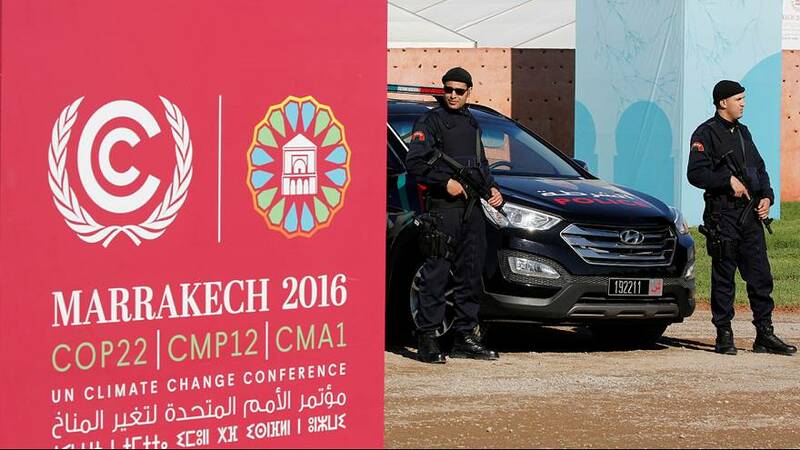 It is the host of COP 22 which began when the Paris Agreement came into force. It is being held in the city from November 7 to November 18 and is seen is the last opportunity to act because the impact of climate change on vulnerable populations and poor countries is a disconcerting reality today. Segolene Royal President of COP21 and French Minister of the Environment has passed the torch of the presidency for COP 22 to Salaheddine Mezouar the Moroccan Minister of Foreign Affairs. “COP is to show that in technology, the ability of pro-environmental finance and stocks – which have all been discussed over the past twenty years – have finally come to be realised. ‘And the projects we have here in our country Morocco are very interesting. We have realised things in the sun, in wind power and energy efficiency in agriculture. These are the themes which will affect people and especially those in the south. We want to show that COP is active, there are concrete actions, specific projects to improve both food security, access to water, the fight against desertification. All these themes are real projects for citizens of all countries of the south,” Said Mouline of the COP22 committee explained. All non-state actors involved in the fight against climate change are in the Green Zone where there are side events, exhibitions, conferences and areas for presentations. There are activities to share knowledge and experiences, the presentation of best practices and the confirmation and launch of pro-climate action initiatives. There was a dedicated different theme in the Green Zone each day. “In the Blue Zone individuals and groups can talk to government delegations and negotiators to seek acceleration on the part of governments to implement the Paris agreement. But any implementation can not just be a transition to other sources of energy if it is not backed up with development for people in countries in the south. So we need a transition which takes into account the fact that people in the south are not responsible for the situation in which we find ourselves now,” Driss El Yazami told euronews. It is time to look at ways to take action and fight against global warming. The most important issue in Marrakesh is to agree on a deadline to decide on rules for implementing the agreement.